2017 Aug 22 — Shamanism: Spiritual Practice or Religious Belief? The shaman is one who mediates between the visible world of form and matter, and the invisible world of energy and spirits. For the shaman, there is no supernatural world. Only the natural world exists, with its visible and invisible dimensions. Throughout the last century, science has dismissed the mysterious world of the ancients. Electron microscopes allow us to peer deeply into the heart of matter; invisible “spirits” have been catalogued as microbes; and space telescopes show us that behind the blue sky there is no Heaven, only the vast darkness of space. The quest for the single explanation that could unite all the observed forces at play in our universe left the arena of religion and spirituality, and became the search for the Unified Field Theory. Today many of us feel compelled to describe our art and practice using the language of quantum physics, in an attempt to give the shamanic arts more credibility. I believe that doing so actually devalues the 50,000-plus year tradition of shamanism. 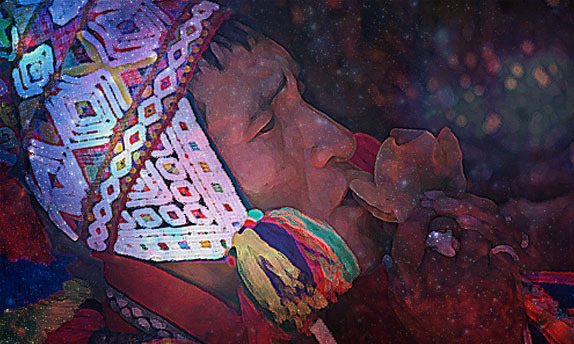 Shamanism is a spiritual practice, not a religious one. Spiritual practices are based on personal, direct experience, and are replicable by others who choose to undergo the practices and initiations. Religion, on the other hand, is based on belief. My teacher, an old man from the high Andes, once said to me as we walked the edge of Lake Titicaca: “Religions are simple concepts of spirituality — values, standards, truths, principles communicated in the form of a story that uses poetry and metaphor to illustrate its wisdom. Stories that have been told and retold until even their embellishments acquire profound meaning, the figurative is taken literally and the lessons are lost. And my friends, the priests, were devoted caretakers of a story that was not their own. “But the shaman is the author of the story, the mythmaker. El Viejo’s [his teacher’s] faith was based on his own experience of the Divine in Nature. A shaman stands with one foot in this world, and one foot in the world of Spirit. With the priests and in the schools, I learned the lessons of others. With El Viejo, I learned my own lessons. Shamanic training often follows the path known to the Greeks of old as the journey of the wounded healer, during which the shaman developed her powers and abilities as she healed herself. This is the model that I rely on when we train Western shamans at The Four Winds Society’s Light Body School of energy medicine. I believe that it is essential to heal ourselves before we start ministering to others. But the shaman is different from the mystic, who can also go through a process of healing and discovery of the invisible world of energy and spirits. The shaman is dedicated to service to her community, whereas the mystic is dedicated to dwelling on her own experience of the divine, and lets the world unfold as it may. He believed that many of those called to this work had sat together many times before around a fire in the Great Plains, with the Buffalo behind us, or meditating above the snow line in a stone temple like the Inka built.